Zenith is one of the oldest watch companies est.1865 and one of only a handful which still produces its own mechanical movements. The company has an almost unparalleled record of technical achievements and notably, in 1929, Zenith won world renown at Kew Observatory (England), when a Zenith wristwatch won first prize for an accuracy of better than 0.6 seconds per day. During the late 1940s and throughout the 1950s, Zenith held the lead in producing the most commercially successful and the most technically advanced, chronograph wristwatches. The technical expertise craftsmanship which went into these watches was immense, making them very expensive watches at the time. In 1969, Zenith introduced the world’s first automatic chronograph. Not only this, but it was able to measure short time intervals at athletics events, accurate to within a tenth of a second which was an unsurpassed world record even to this day! Zenith has also been recognised with more than 1500 awards and over 50 individual movement designs to its name, making it the Swiss brand with the most awards for precision. Zenith is also known for providing chronograph movements to some of the world’s most famous Swiss brands including Rolex and Patek Philippe. Here we have a superb, fully restored and guaranteed example of a circa 1954, Gentleman’s 17 Jewel, Calibre 156D, Zenith Chronograph in simply stunning condition. The watch has an 18ct solid Pink Gold case and was all made in-house by Zenith in Le Locle, an area often known as ‘the cradle of Swiss watchmaking’. Just delightful! 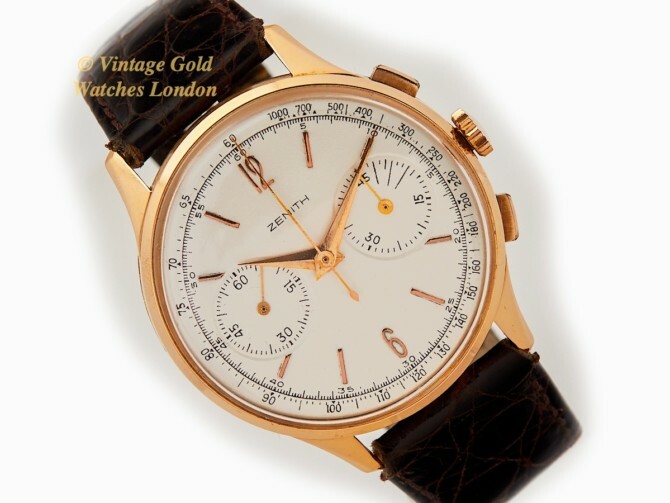 A Pearl White, twin register chronograph dial with pink gilt baton hour indices, complemented by the original restored Dauphine hands, in perfect condition. The outer scale is known as a Tachymeter scale and can be used in conjunction with the chronograph function to measure speed, or distance travelled. This is the original dial which has been restored to the highest standards by our dial restorers, considered to be the best in the UK. The lens has been replaced with a new original replacement part. This watch has evidently been very well cared for and used sparingly as the beautiful 18ct solid pink gold case with swept back lugs is in near perfect condition. Pink gold watches were much rarer during this period, making this watch rarer and more sought after than the yellow gold equivalent. At 37.5mm in diameter, not including the Zenith crown, this is a very large-sized wristwatch for this period. Upon opening the case-back, all is perfect and as it should be, signed Zenith and with Swiss 18ct hallmarks with 18K and 0.750. Externally, the case-back carries the case serial number 913345. The case has been professionally cleaned and lightly polished and is in superb condition, although the watch has obviously been very well cared for, as there are no dings, scratches or marks visible to the naked eye. The case-back is of full thickness and has never been engraved and also shows no signs of wear visible to the naked eye. As ever our standard advice applies: Vintage watches should be kept clean and dry at all times. This is the famous high grade Zenith 17 Jewel, Cal.156D chronograph movement which helped to establish Zeniths name as the world’s leading manufacturer in wristwatch chronographs. This particular watch movement is in stunning, sparkling ‘as new’ condition. The movement has been fully overhauled and serviced by our watchmaker. This involves complete dismantling of the movement to each of its component parts, ultrasonic cleaning, microscope inspection and replacement of parts as required, only with new Zenith originals, then careful assembly and oiling ready for final testing and careful calibration. The watch is now running perfectly, having been calibrated and timed at +6 seconds per day which is truly outstanding for any watch of this age. The watch has a runtime of 44 hours from its fully wound state which shows the movement is particularly strong and running and well within expected parameters. It is now ready for many more decades of faithful service and we are therefore more than happy to offer this watch with our 12 months’ warranty* and to assist with servicing again in the future. With care and with regular servicing, say every 3 to 4 years, we would fully expect this watch to run quite happily for another lifetime! Our watchmaker commented that he found the movement to be especially clean and in excellent condition. *Please note – our 12 months’ warranty is only applicable if the list price is paid. A new high quality Brown Crocodile strap is fitted with an original period Zenith gold plated buckle. However, if a different colour or style of strap is preferred, please let us know and we will do our best to oblige free of charge. We carry tan, conker, dark brown and black in stock in plain padded leather, crocodile skin or lizard skin. We can also obtain most types and colours from our partners at ‘Watch Obsession’ within 48hrs. Please take a look at their huge range of 20mm straps if you wish. Although there are no original papers with this watch, the numbers and markings on the watch are all correct. These and the style of the watch and dial indicate the date of the watch to be c1954. Detailed particulars will be included with our purchase receipt and 12 months’ warranty*. A separate insurance valuation for the replacement value of this watch will be provided at the time of sale along with our unique ‘Lifetime Authenticity Guarantee’ which states: “If this watch proves to be anything less than totally authentic, or not as described, Vintage Gold Watches of London will offer you a full refund at any time”. As with all our watches, this watch will be sold under our 14 days no quibble sale or return policy. The watch will be supplied in a new high quality, hardwood presentation box, as shown. This really is a magnificent vintage chronograph watch from Zenith, one of the leaders in its class. Very large for the period and wonderful to find in 18ct pink gold. We often hear how fantastic Zenith movements are and considering their history, we have never understood why they are not better known, or indeed famous! Technically they equal or better than anything from any of the top Swiss watch houses. Whatever the reason, this is changing and right now they represent amazingly good value for money. A word on our prices – We always try our hardest to acquire the very highest quality watches we can find, before restoring them to the highest possible standards. We then offer these at the fairest prices we can, taking into account our pre and post sales care and service. This approach means we will never be the cheapest, but nor will we be the most expensive. Indeed there are some well-known stores in West London which are highly successful charging between two to three times the price you see here. We therefore consider our prices to be fair, given the quality of watches we have to offer. If you have any questions please call on our Landline 0207 727 7095 or Mobile 07515 949250 or if calling from overseas, on Landline +44 207 727 7095 or Mobile +44 7515 949250. Please note, we also welcome part exchanges. If you have a watch or small collection for sale, please contact us as we will be happy to discuss.